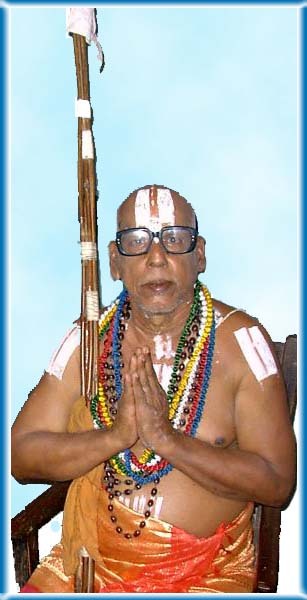 Metkalai — the open-minded Sri Vaishnavism. We offer a unique blend of northern (vaḍakalai) and southern (teṅkalai) traditions of India adapted to a modern western millieu. Promoting the teachings of Sri Ramanuja Acharya (who did not belong to any "kalai"!) and all Purva-acharyas of both factions, as well the Vedic and Pancharatric ritual practice. We are totally commited to a policy of absolute non-discrimination of any sort based on race, caste, creed, sect, gender or sexual-orientation. Our teachings, meetings, prayer sessions and feasts are open to every one, and every one is encouraged to participate. Our guiding principal is that all sentient and insentient beings are direct manifestations of the Supreme Being. This Matham (preaching center) was established by the instruction of H.H. Varada Yatiraja Jeeya Swami (pictured on the left) the erstwhile pontiff of Yatiraja Matham Sriperumbudur — the birthplace of Ramanujacharya. One of his greatest wishes was to see the establishment of a branch of the Sriperumbudur Matham in the west. In 2000 he appointed his first western disciple Sri Rama Ramanuja Achari to establish such a center in Australia. For the past 13 years we have been conducted regular classes and workshops in Vedanta philosophy, Sanskrit and Vedic & Tantric ritual and conducting festivals & ceremonies. Sydney based Acharya Ram Sivan (ordained as Sri Rama Ramanuja Achari), was born in South Africa of a Jewish mother and Christian father, and rasied by Hindu nannies. He was baptised as a Christian and had a basic education in Christianity and Judaism and underwent a barmitzvah. He formally converted to Hinduism at the age of 15. In 1969 he emigrated to Israel where he spent a decade studying Judaism, Christianity and Islam as well as training to be a registered nurse. He also spent 3 years in India undertaking formal study in Yoga-Vedanta philosophy, Logic, Hermeneutics, Sanskrit, and Astrology, as well as specialising in Vedic and Tantric ritual. He studied in the traditional gurukula system in highly respected centres of spiritual and Scriptural learning in Rishikesh, Varanasi, Tirupati and Chennai. In 1982 he emigrated to Australia. He has practiced as a Hindu Priest and teacher of Yoga-Vedanta philosophy for over 40 years, and has travelled extensively to spread the Dharma, including in USA, South Africa and Bali. He was inducted as a preceptor (Acharya) into the South Indian Srivaishnava (Iyengar) lineage in 1990, by the pontiff of Sriperumbudur; His Holiness Sriman Varada Yatiraja Jiyar Swamigal, with full rights of initiating others, teaching philosophy and Scripture, and conducting all the Hindu ceremonial and sacramental rites (pertaining to temples, and domestic life cycles). 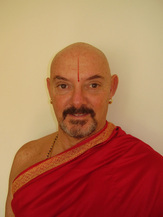 Acharya Sivan is one of the founding members and the current public relations officer of the Australian Council of Hindu Clergy. He has participated in the consecration of a number of Australian and American Hindu temples, tutored other priests, and is the published author of a number of books on Hindu subjects. The acharya is much in demand as a domestic priest and as a Dharma teacher. He is involved in a number of Yoga schools conducting classes of philosophy as well as workshops in USA, Australia and Bali. He also plays an active pastoral role in counselling members of the Hindu community on their social and personal problems. He is also very active in conducting training sessions at various Sydney Hospitals in Hindu attitudes towards death and dying. Ram Sivan is fluent in English, Sanskrit, Hindi, Hebrew and conversational Arabic and Tamil.